Apostrophe Before S or Apostrophe After S- How to use Apostrophes? Many English learners have difficulty with using apostrophe. They are not certain where to use an apostrophe and when to use an apostrophe. In the article below you will learn whether to use apostrophe before ‘S’ or after ‘S’. Indeed, we use an apostrophe to show possession or omission, but in this article you will learn how to use this punctuation mark for possession correctly. 1. If the ownership or relationship refers to a singular regular common noun, the apostrophe should be used before s (`s). My brother`s English is very strong. That is my friend`s house. 2. If the ownership or relationship refers to a plural regular proper noun, the apostrophe should be used after s ( s` ). My brothers` car isn`t that new. My friends` house looks beautiful. Our relatives` friends go to Makah next year. His sisters` English isn`t strong enough. 3. If the noun is already plural we use the apostrophe after s ( s` ). If the relationship or ownership refers to a common noun, using apostrophe is not common, but instead, you may use (noun + of + noun). LearnESL`s authors are very intelligent. 4. Many common nouns and proper nouns ending in ‘S’. There are conflicting policies and theories about how to show possession when writing such nouns. Some writers just add an apostrophe to all nouns ending in ‘s’. And some add an apostrophe + ‘s’ to every proper noun. 5. One method, common in newspapers and magazines, is to add an apostrophe + s (‘s) to common nouns ending in s, but only a stand-alone apostrophe to proper nouns ending in s.
6. 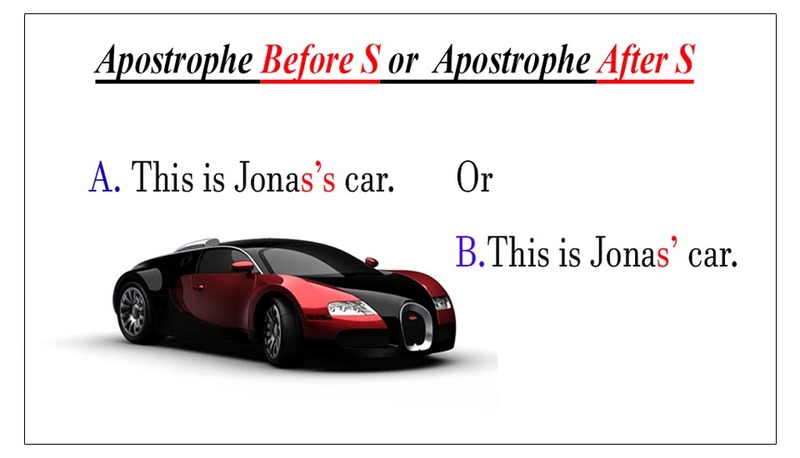 In a question the apostrophe must be placed outside the word. If the ownership or relationship refers to one person, use apostrophe after the proper noun. Ahmad`s car is too old. Jamal`s brother teaches English at Perfect. If the ownership or relationship refers to two people, use a conjunction between the two proper nouns and apostrophe after the second noun. Jamal and Ahmad`s car is made in Japan. Jamal and Ahmad`s father works with an NGO. If the ownership or relationship refers to more than two people, use a comma after each proper noun, a conjunction between the last two proper nouns, and apostrophe after the last proper noun. Ahmad, Jamal, Kamal, and Ali`s house is too old. Ahmad, Jamal, Kamal and Ali`s father is a teacher. Remember: In the last case, a comma before the conjunction is optional. Pay close attention to the above examples. The 8 Essential Books that Every College Student Should Read!